This tufted fairy club fungus, the type species of the Clavaria genus, is easy to spot… but only when it is growing in short grass. 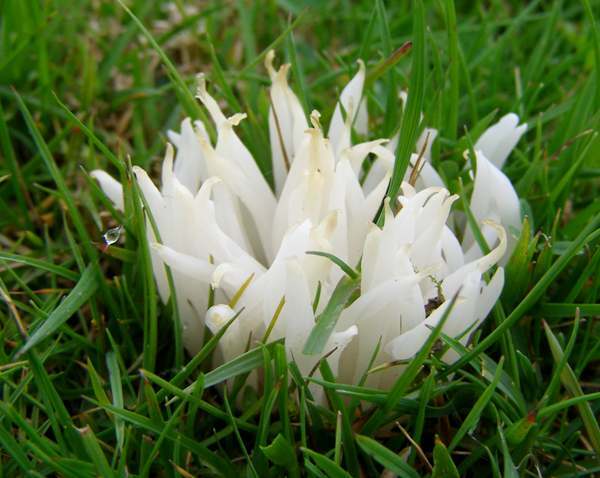 Fairly common throughout Britain and Ireland, Clavaria fragilis is also found in most parts of mainland Europe. This species is reported also from Africa, Asia, Australia and North America. Some club-like and coral-like fungi are ascomycetous, but fairy clubs of Clavaria and related genera belong to the Basidiomycota. White Spindles was first described scientifically in 1790 by Danish mycologist Johan Theodor Holmskjold (1731 - 1793), who gave this species its currently accepted scientific name. The name Clavaria fragilis was later sanctioned by the the great Swedish mycologist Elias Magnus Fries in his landmark publication Systema Mycologicum of 1821. Synonyms of Clavaria fragilis include Clavaria cylindrica Gray, Clavaria vermicularis Fr., Clavaria vermicularis var. gracilis Bourdot & Galzin, and Clavaria vermicularis var. 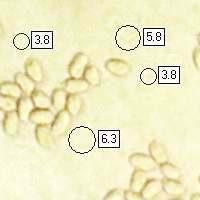 sphaerospora Bourdot & Galzin. The generic name Clavaria comes from the Latin clava, meaning a club. Equally obvious, and again from Latin, is the specific epithet fragilis, which means fragile. These worm-like eruptions are very brittle and they usually snap into pieces if you try to bend them or even to remove blades of grass to improve the aesthetic appearance of a photograph. 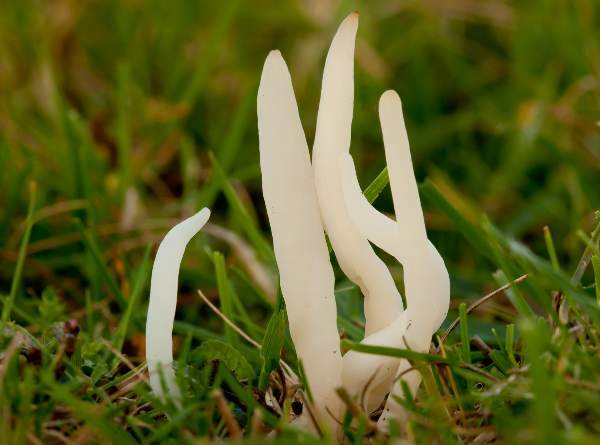 In the past these strange little fungi have been referred to by several other common names including Fairy Fingers and White Worm Coral. Often somewhat laterally flattened and sometimes longitudinally grooved; sometimes straight but more often wavy; occasionally forked near tips, but most often simple clubs with rounded tips; white, the tips yellowing and eventually turning brown with age. As the specific epithet suggests, these are very fragile club fungi. 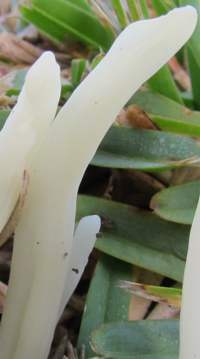 The individual stems are typically 2 to 12cm tall and 4 to 5mm across. 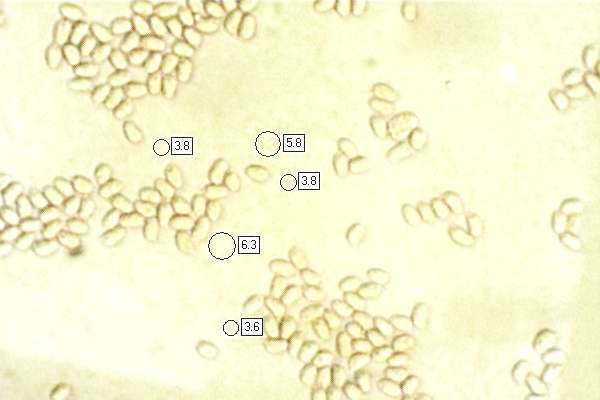 Ellipsoidal, smooth, 5-7 x 3-4µm, with small droplets. Saprobic, on the ground in unimproved grassland and in leaf litter on woodland edges and clearings; less commonly in dense woodland. Clavulinopsis fusiformis has a similar form but is golden yellow. White Spindles fungi are reported to be edible, but their scarcity and diminutive stature makes the collection of these fungi for food not worthwhile.